The Riemann Hypothesis is an unproven mathematical conjecture about the zeros of ζ(s) on the line x = ½ – there is a pending $1M Millenium Prize for proving that conjecture. Voronin's Universality Theorem (which is proven, unlike the Riemann Hypothesis) states that if the Riemann Hypothesis is true, then ζ(s) can approximate any analytical function arbitrarily well somewhere inside the strip between x = ½ and x = 1 – essentially, ζ(s) "contains" all analytic functions (including itself) like a fractal and all possible patterns of continuously varying complex values are represented in that region. This blog will describe in detail how to create a Spread.NET custom function which calculates the Riemann Zeta Function for a specified set of points along the line x = ½ – where the nontrivial roots are located – and highlight the values calculated that are closest to the roots using a conditional format. When you need a formula function that isn't available in Spread.NET, then you can implement a custom function class to calculate that function. In Spread.NET 12 Windows Forms, the base class for custom functions is GrapeCity.CalcEngine.Function. In earlier releases (before version 11), the base class for custom functions was FarPoint.CalcEngine.FunctionInfo, and that class is still supported for backwards compatibility, but it is better to refactor the code for the custom function to use the new Function class instead. This blog will show the ZETA function implemented both ways, to illustrate how easily a custom function class can be ported to Spread.NET 12 Windows Forms. What are the arguments for the function? Which arguments will accept references, and which will require values? For the arguments which accept references, which types of references are allowed? Will the argument accept only a single-cell reference like INDIRECT()? Will the argument allow a range reference like SUM() and use the number values in the whole range? Will the argument allow a range reference like ABS(), which normally operates only on a single cell, and return an array of values with ABS() applied on each value individually, like the internal releases of Excel 2019 which support "spilling" array values? Implement the custom function – this requires writing a new class inheriting from GrapeCity.CalcEngine.Function. 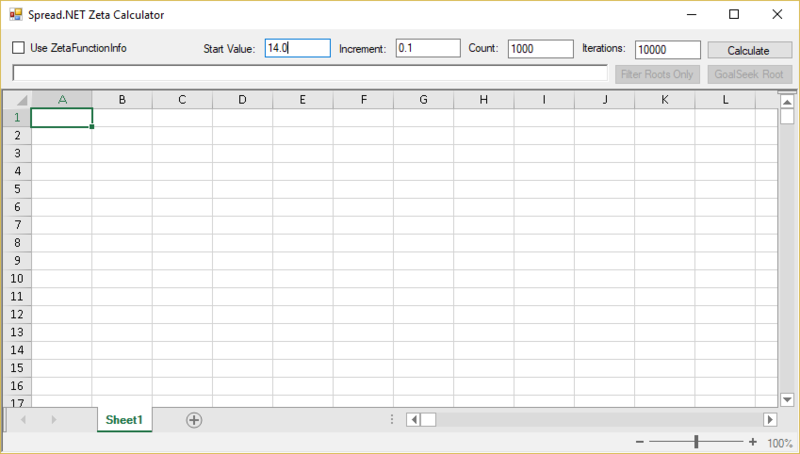 The function returns an array of values with count rows and 2 columns, with the real component of the complex value in the first column and the complex component in the second column. The real_part argument is the real value component of the complex number s for which ZETA will be computed – this value is always 0.5 since we're looking for the non-trivial root values, but the implementation of the function can work using any value > 0. The imaginary_part argument is the imaginary component of the complex number s for which ZETA will be computed – this value is specified in a text box (textBoxStart) at the top of the form. The count argument is the number of ZETA points to calculate and return – this value is specified in a text box (textBoxCount) at the top of the form. The default value for count is 1000. 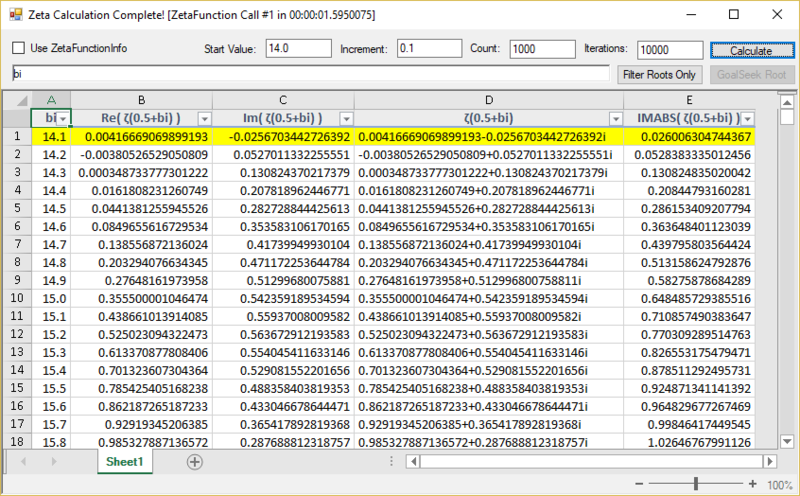 The function is designed to calculate the ZETA function for count points and return the function values as an array of values with count rows and 2 columns. Each row in the array contains a complex number value of ZETA computed for the point, with the real part in the first column and the imaginary part in the second column. The increment argument is the distance between each ZETA point calculated and determines the resolution of the root search – this value is specified in a text box (textBoxIncrement) at the top of the form. The function is designed to calculate ZETA for the initial complex number s plus increment, then calculate the value for the complex number s + 2 increment, etc. until count* values have been computed. The default value for increment is 0.1 and searches for root values every tenth, and this is recommended for optimal efficiency. Changing the increment will change the resolution of the search – for example, using increment of 0.01 will search for root values every hundredth and thus finding more decimal places in the root value. The iterations argument is the number of partial sums to compute for the infinite series – this value is specified in a text box (textboxIterations) at the top of the form. The default value for iterations is 10000 and this should be enough to calculate ZETA accurately to 2 decimal places for values of s < 1000. If calculating ZETA to more decimal places (e.g. changing increment to 0.01 or 0.001) or if calculating ZETA for large values of s (> 1000), then it might be necessary to increase iterations to 10000 (this will affect the performance of the calculation). In that case, you can compute ZETA for fewer points by decreasing the value for count in textBoxCount. The ZetaFunction class inherits from GrapeCity.CalcEngine.Function and overrides the protected virtual Evaluate method with logic to handle calculating the ZETA function. 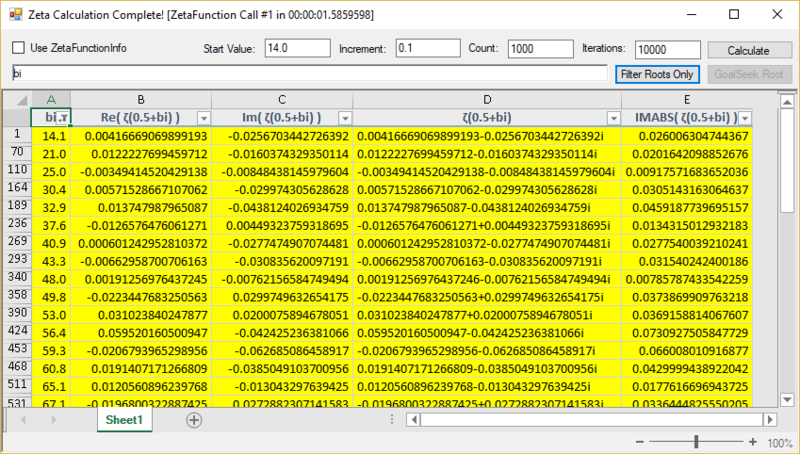 This example also implements some logic to track the number of calls to the function and time the calculation. The array formula applied to calculate the ZETA function and produce the table of results is calculated just once to produce the array of results in the table. Since each point calculated in the array is independent of the other points being calculated, the loop calculating the point values can run in parallel, so Parallel.For is used to optimize calculation performance. This requires creating a Task which contains the Parallel.For logic inside a lambda function, and executing the Task synchronously (otherwise you get recurrence and stack overflow). The override for Evaluate uses the IArguments passed into the function to get the number of arguments specified and to get the value of each argument using IValue.GetPrimitiveValue, specifying the IArguments.EvaluationContext for relative reference resolution and context-sensitive functions. The IValuesArray array is created using IValue.CreateValuesArray on result – note that the logic does not directly call IValuesArray.SetValue inside the Parallel.For code, because calls from other threads are not allowed. Instead the Parallel.For executes synchronously, using Interlocked.Exchange to set the results to a captured temporary array variable, blocks the main UI thread until all calculations are complete, and then safely copies the results from the temporary array of double to array. 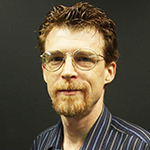 At the end of this post, I will show the same custom function implemented using the old FarPoint.CalcEngine.FunctionInfo, which is still supported for backwards compatibility. If you have custom functions using this class created for earlier versions of Spread.NET, then you can use that as a guide to help with porting your custom functions to using the new GrapeCity.CalcEngine.Function class instead. The first column A in the result shows the imaginary values bi along the line x = ½ for which ζ will be calculated. The second and third columns B and C show the calculated result of ζ(0.5+bi), with the real part in column B and the imaginary part in column C. The fourth column D shows these values combined into one imaginary value in column D using the COMPLEX function, and the fifth column E shows the complex absolute value using the IMABS function. The complex absolute value is the distance between the complex value and the origin value 0. If Not Double.TryParse(textBoxIncrement.Text, incr) Then Return "0.0"
Text = "Calculating, please wait..."
sheet.Cells(0, 1).Text = "Re( ζ(0.5+bi) )"
sheet.Cells(0, 2).Text = "Im( ζ(0.5+bi) )"
sheet.Cells(0, 4).Text = "IMABS( ζ(0.5+bi) )"
Dim formula As String = "ZETA(0.5,RC1," + rc.ToString().Trim() + "," + incr.ToString().Trim() + "," + iter.ToString().Trim() + ")"
sheet.Cells(1, 3, rc, 3).Formula = "COMPLEX(RC2,RC3)"
sheet.Cells(1, 4, rc, 4).Formula = "IMABS(RC4)"
sheet.RowHeader.Cells(0, 0).Text = " "
Dim conditionformula As String = "AND(RC5<" + incr.ToString() + ",RC5<RC5,RC5<R[-1]C5)"
Text = "Zeta Calculation Complete! [ZetaFunctionInfo Call #" + ZetaFunctionInfo.cnt.ToString() + " in " & (ZetaFunctionInfo.t2 - ZetaFunctionInfo.t1).ToString() & "]"
Text = "Zeta Calculation Complete! 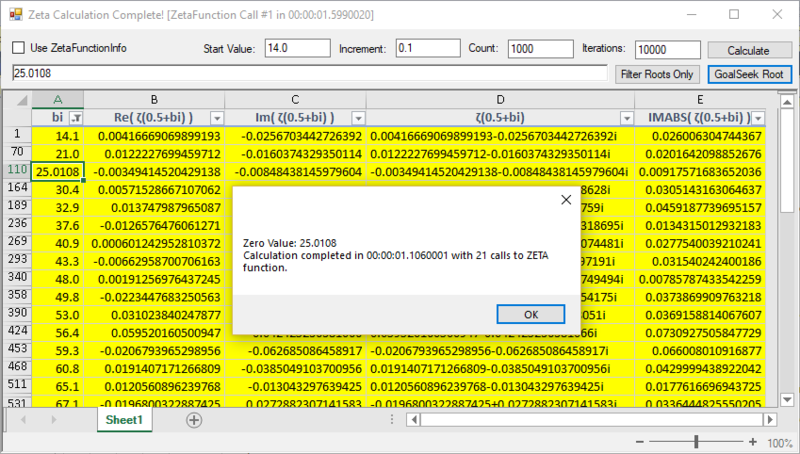 [ZetaFunction Call #" + ZetaFunction.cnt.ToString() + " in " & (ZetaFunction.t2 - ZetaFunction.t1).ToString() & "]"
Note that the SheetView.AddCustomFunction method is now marked obsolete and deprecated – custom functions using FarPoint.CalcEngine.FunctionInfo should be ported to using the new GrapeCity.CalcEngine.Function class instead. formula = "ZETA(0.5," + value.ToString().Trim() + ",1,0," + iter.ToString().Trim() + ")"
formulaNext = "ZETA(0.5," + (value + maxchange).ToString().Trim() + ",1,0," + iter.ToString().Trim() + ")"
formulaNext = "ZETA(0.5," + (value - maxchange).ToString().Trim() + ",1,0," + iter.ToString().Trim() + ")"
This is certainly not the most optimal implementation for goal seek – there are much better ways to do that I'm sure – but the purpose of this code is really to show how easily you can call into the calculation engine to calculate formulas in code using the Spread.NET API. Note that the code inside the Task is identical, and only the outside code has changed – the logic which gets the function arguments and returns the array of results. The old FunctionInfo API required implementing a custom class inheriting from CalcArray to return the array of results; this is no longer required using the new API. In another article, we show you how to implement advanced formula tracing and auditing for spreadsheets. Thanks for following along, happy coding!